The Employee Notice of Corrective Action is sent to an employee when they need to take corrective action on a problem. guys I would have lost countless agreements." This Employee Notice of Corrective Action is included in editable Word format that can be customized in Word or by using the included Wizard software. To: First Last, Contract Job Title. Re: Notice of Corrective Action. This notice is to inform you of the corrective action that must take place in order to remain employed with Company Name. Policy / Procedure Violation Behavioral. Include the period of time in which this should occur. I, the undersigned, acknowledge the receipt of this Notice of Correction. I understand that my signature does not imply explicit agreement or disagreement with this notice and merely acknowledges that I have read and understand the reason for this notice. 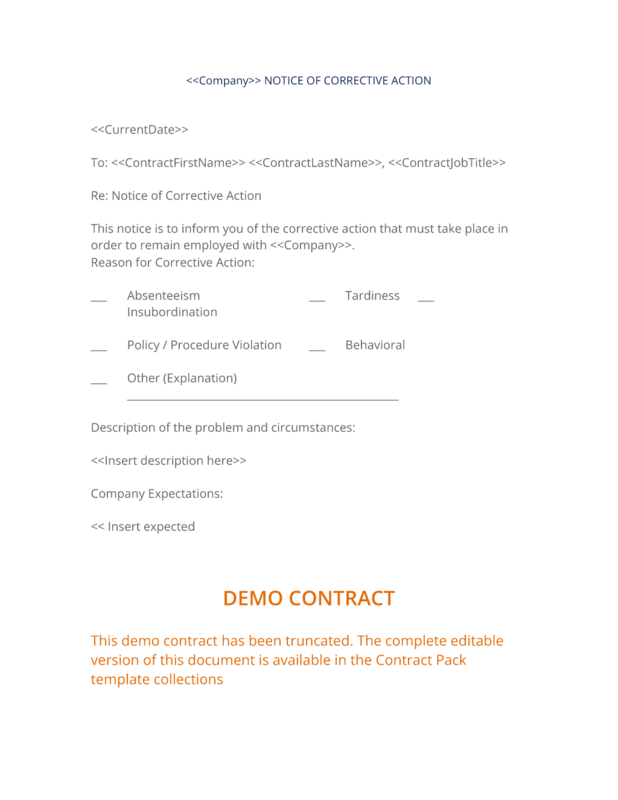 The complete Employee Notice of Corrective Action - with the actual formatting and layout - is available in this Contract Pack.